Here’s what’s up in the world of TV for Thursday, December 22. All times are Eastern. A Charlie Brown Christmas (ABC, 8 p.m.): It’s just three days until Christmas and two days until Christmas Eve. But don’t despair if you haven’t quite found yourself in the holiday spirit yet. A Charlie Brown Christmas is here to help! Charlie bemoans Christmas commercialism as he and his friends plan a holiday pageant. Then everyone learns a lesson about Christmas values and/or the importance of helping your friends battle seasonal affective disorder. For those who need a little extra incentive to tune into this 51-year-old special this year, ABC is also airing a new set of animated vignettes based on other Peanuts strips. Terry Crews Saves Christmas (The CW, 8 p.m.): As Jo March once exclaimed, “Christmas won’t be Christmas without a week-long Terry Crews holiday special!” Thankfully The CW planned ahead this year. This five-part special follows Crews as he visits “hopeless holiday enthusiasts” and helps them throw snazzy holiday parties with the help of a team of experts. The whole thing is billed as a “crash-course in how to do Christmas right.” And while it’s not immediately clear why Crews’ brawny comedic presence was paired with this particular premise, we’re of the opinion that there’s no such thing as too much Terry Crews. So we’ll take what we can get. Top Chef (Bravo, 10 p.m.): While most of The A.V. Club is on a holiday break this week, Randall Colburn is diligently sticking to the Top Chef beat. 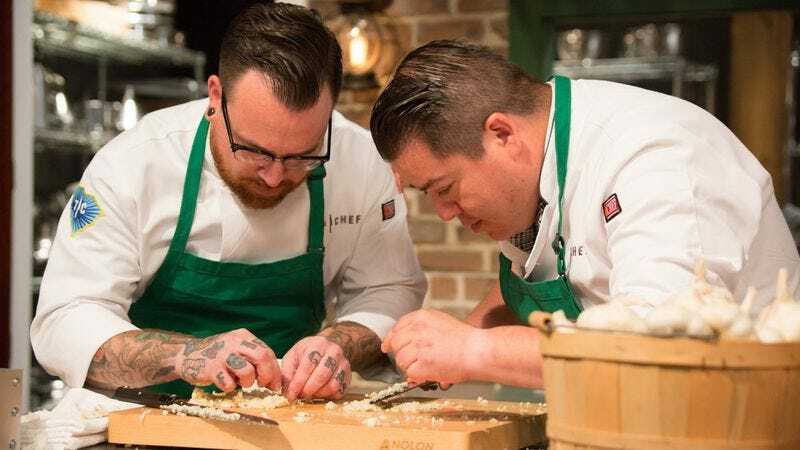 Tonight’s episode has a holiday twist: The chefs have to create dishes with “an odd mix of ingredients and tools found inside gift boxes.” Then they cook up an Italian-American seafood dinner using particularly undesirable fish species. Which lends the episode the delightful title, “The Feast Of Seven Trash Fishes.” Yum. Randall can’t wait to dig in! Project Runway (Lifetime, 8 p.m.): It’s time to say “auf wiedersehen” to Project Runway’s 15th season. Upcoming Spider-Man: Homecoming star Zendaya stops by the show’s season finale to help judge the contestants’ New York Fashion Week collections. And Project Runway crowns yet another winner to add to the show’s impressive legacy. Project Runway: Junior (Lifetime, 10 p.m.): Then it’s out with the old, in with the new as Project Runway: Junior returns for a second season. Twelve insanely talented young designers attempt to impress judges Aya Kanai, Christian Siriano, and Kelly Osbourne. Of course, the true arbiter of taste has been and always will be mentor Tim Gunn. Falling Water (USA, 10 p.m.): After failing to make much of a splash this fall, USA’s mysterious genre series wraps up its first season. And, unfortunately, the episode description doesn’t give us a lot to go on: “Tess tries to protect the boy; Taka attempts to appease the Green; and Burton strives to heal the Woman in Red.” In other words, it sounds like colors are far more important to this series than we would’ve guessed. We’re betting the culprit was Professor Plum with the rope in the conservatory. White Christmas (Netflix): We normally try to stick to TV shows for our streaming pick, but considering it’s the holiday season, we’re bending the rules a bit. Because if there’s anyone worth bending the rules for, it’s Bing Crosby, Danny Kaye, Rosemary Clooney, and Vera-Ellen. This 1954 classic combines holiday sentiment with “Let’s put on a show!” verve. Funny, touching, and full of catchy songs, it’d be worth seeking out even if it weren’t so readily available to stream. As they say, Vermont should be beautiful this time of the year, with all that snow.